Yesterday in MECH 012, we were in the CAD Lab learning the software Auto Desk Simulation Mechanical. It was really interesting to see and learn how the software is able to calculate different types of stresses and displacements with any type of force that you may wish to apply to any type of design that you make(we actually have project on this using MATLab). 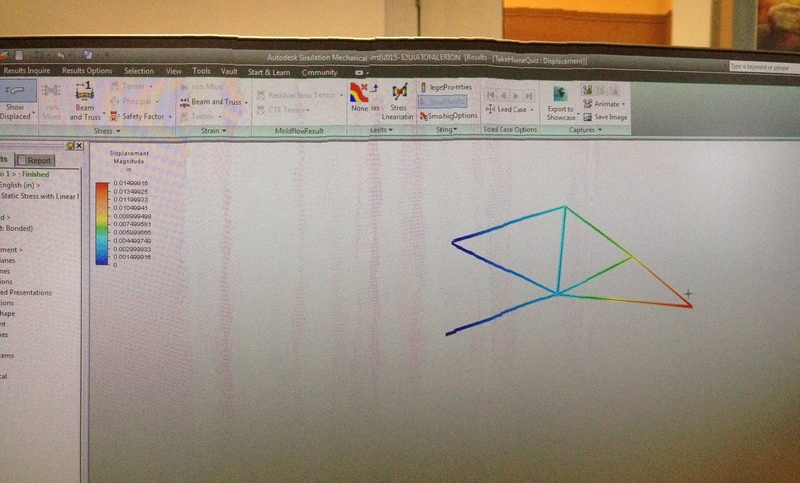 This figure here is a 2-D truss I made with an external force being applied at the right end where the truss appears red. Using the simulation, we can determine the forces, stresses, and displacements of each bar. Now think for some time and imagine doing this by hand….. It takes really long! But it’s something we have to do for a take home quiz so that our solution is the same with that of the Auto Desk Simulation.